"The place you are looking for." Lazy Dayz's goal is to provide our customers with a unique social experience, an experience that is a break from the high paced, chaotic world in which we live. Customers are treated to exotic and high caliber tobaccos in a comfortably laid back atmosphere, where friends and family can get together and enjoy some time-out. Lazy Dayz is built on three core values: superior customer service, superior products, and a superior experience. 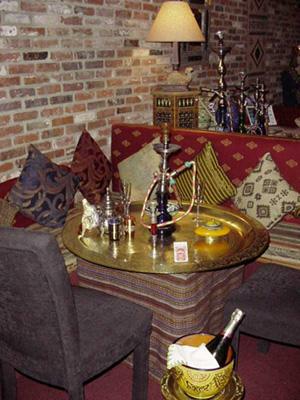 The "uniqueness" of the Lazy Dayz experience comes from the centuries old Arabic water pipe, or hookah. We feature an unprecedented 76 flavors of shisha (or tobacco) to enjoy. Once you enter a hookah lounge, it is easy to see why everyone loves it. The hookah itself engages the customer, making for a relaxing yet stimulating experience. The first thing you'll notice is the pleasant aroma emanating from the lounge. Fragrances of strawberry, watermelon, orange, and more will quickly fill your sense of smell. Your eyes will quickly be drawn to the hookahs, which are true works of art. After you get past the hookahs, you'll notice our incredibly laid back atmosphere, comfortable couches, plasma screen TVs, and our two snakes, Ray and Pharaoh. You'll hear only the best and most eclectic mix of music around. There truly is something for everyone here. Our courteous staff will take care of everything you need. Don't hesitate to ask us any questions about hookah smoking. We spend time with every customer, explaining all the different varieties, and will make sure you get what you want. We pride ourselves on our staff, the most knowledgeable staff working at any hookah lounge. We'll have you set up and ready to enjoy an evening in no time. In addition to the hookah experience, Lazy Dayz also offers an exotic retail experience. We will sell hookahs, shisha, and accessories. In addition, we also offer quality cigars, cigarettes, and accessories. Bring your friends and join us for a unique and relaxing evening that you won't get anywhere else. Lazy Dayz was started in February of 2006 as a simple hookah lounge, catering to the local college crowd. Four college-aged guys had a dream of providing the preeminent hookah experience. Lazy Dayz is that dream realized. An old laundromat was gutted and cleaned up. It did not take long for the cold and harsh laundromat to turn into the warm and inviting hookah lounge. Hard work and dedication has built this company. Our dedicated customers are what keeps this company growing and make it all possible. We truly have the best, most grateful customers of any establishment. Extremely Smokey place, but still a great enviornment.